This is a fascinating window into early Jewish evangelism in America before World War II and the establishment of Israel as a nation. Arthur grew up in an orthodox Jewish household in Germany. He recounts the passion that his father displayed for the festivals, prayers to the dead, and continual repentance for sins. He shares his childhood struggles, the yearnings for peace, his marriage, his intersection with Roman Catholicism, his diligence in his law career, his encounter with Jesus Christ that changed everything, and his persecution by orthodox Jews. Daily will I pray for thee. Why such a message sent to me? I cried and Jesus set me free. Him you still impostor call. Do not now so hardened be. Fly, oh fly to His embrace. Eventually, God brought the Michelson family to America. In 1928, Arthur founded the Hebrew Evangelization Society in Los Angeles, California. His advisory board consisted of the following pastors: H. Eilertsen, Alfred Inwood, O. D. Ironmonger, E.B. Joseph, Wm. Kirby, E.A. Lacour, H.B. Macrory, W. F. Ploat, A. J. Smith, Oswald J. Smith, Jacob Stocker, and John W. Underwood. When the Lord called me into His work He gave me the vision of establishing a Hebrew Christian Synagogue in order to bring Jews and Gentiles together, in the brotherhood of love which Jesus Christ proclaimed. I had spoken with several ministers about it but it seemed to them an impossibility and I found no encouragement. One day, while working in the Jewish Ghetto on the east side of Los Angeles the Lord led me definitely to an empty corner on Michigan and Chicago, and while looking at it, the Holy Spirit signified to me so plainly that this was the place for the Synagogue. We prayed and the Lord made it possible for us to buy the place. In March 1931, we moved out to our new headquarters, at 2209 Michigan avenue, and built a temporary meeting place which was dedicated as the “First Hebrew Christian Synagogue,” on the 24th of May, 1931, by a converted Jewish rabbi, Max Wertheimer, who came from Ada, Ohio, for that specific purpose. Songs of Jews and Gentiles filled the place and the glory of the Lord was present. Several years later, the permanent Synagogue was completed. Proper arrangements were made to complete the Christian Synagogue which we finished the beginning of March, 1934. The dedication of the completion took place on the 11th of March, which was a great service. It was the first time in the history of the church that such a Christian Synagogue, in such form and structure, was established, because it combines in its architecture Judaism and Christianity. The latter half of the book shares encouraging gospel testimonies by Miss Frances Stein, Harry Epstein, Mrs. Rose Klein, Isadore Rohr, and Judge Chas. F. Cook. 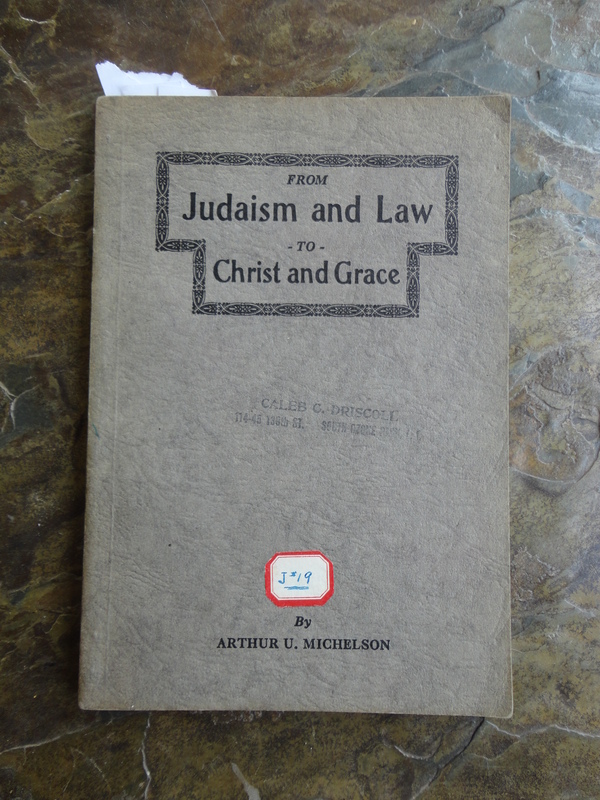 This entry was posted in book reviews and tagged Christ, gospel, grace, Judaism, Law, Messiah. Bookmark the permalink.